Sheffield’s Joe Root is occasionally bamboozled by Adil Rashid’s skills, and is confident his Yorkshire and England team-mate can put plenty of others in a spin at the highest level too. Rashid marked his first chance in a one-day international for almost six years by recording career-best batting and bowling figures in England’s record victory over New Zealand at Edgbaston three days ago. As the hosts prepared to follow up what has been described by captain Eoin Morgan as a “near perfect” demonstration of their new attacking intent, Root made it clear he has great faith in Rashid. He has played alongside the Bradfordian for several years at Yorkshire, and doubtless faced him countless times in the Headingley nets too. 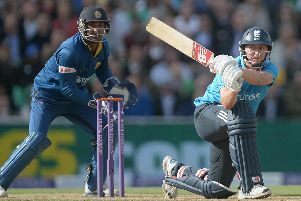 Yet Root, who like Jos Buttler hit a brilliant hundred for England in Birmingham, admits he is still not always entirely sure which way the leg-spinner is going to turn the ball. England have not always appeared quite so convinced, omitting the all-rounder from their plans between November 2009 and last month. The 27-year-old is back with a bang now, though, and Root added: “I’m absolutely thrilled to bits for him. “He’s a cheeky little chap in the changing room. He doesn’t really say much - but when he does it’s great value. “To see him perform like that was great. Rashid had to stay patient as he polished his trade in county cricket. Root said: “I think he went through a period at Yorkshire where he was put under a lot of pressure and given a lot of responsibility for a young lad, and he struggled to deal with it to start with. “Over the last couple of years, he’s managed to do that fantastically well. “He’s come to know his game a lot better and he’s playing extremely well at the minute. Like England, after their brilliant win in the first match of five in this Royal London Series, Rashid must prove he can do it again at The Oval on Friday. “It’ll take a few more games to see where he’s at,” said Root. “But he’s a phenomenal talent - I’ve known that for a long time. A Test future, in an Ashes summer, may even beckon. “I’ve seen what he’s done in county championship cricket, and you’ve seen he can perform well in international one-day cricket. There will be no more Tests, however, for former England wicketkeeper Matt Prior - who has announced his retirement from all cricket at the age of 33, after failing to recover sufficiently from Achilles surgery. Prior made more than 4,000 runs, and an impact on many team-mates and opponents - including Root. He said: “I think he can be immensely proud of what he’s achieved in the game, a three-time Ashes winner who helped England get to number one in the world.